Personality has been studied in octopuses and, although aspects of personality have been found, scientists are not in agreement whether or not this shows that octopuses have full personalities. Large individual differences are commonly found in the behaviour of octopuses, even in standardised situations. Another study by scientist at Macquarie University, Sydney showed ‘episodic personality’ in octopuses. 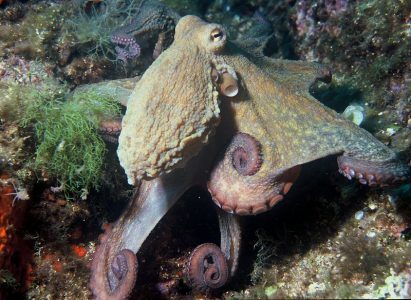 Because octopuses rely mainly on visual signals when interacting with other octopuses, predators and prey, they used video playback to present octopuses with controlled, moving and realistic stimuli in order to test for personality (defined as behavioural differences between individuals that are consistent over time and across ecologically important contexts). They captured wild octopuses and tested them on 3 separate days over a 10 day period. On each test day, the octopuses were presented with videos of a food item, a novel object and another octopus. These represented a foraging, novel and threatening context, respectively. The researchers found that the stimuli evoked clear and biologically appropriate responses from the octopuses. Furthermore, individuals’ responses to the three contexts were highly correlated within a given test day. However, within a given context, individuals behaved inconsistently across the 3 test days. The scientists concluded that rather than fulfilling the criteria for personality, gloomy octopuses show variation over time, and hence display ‘episodic personality’.